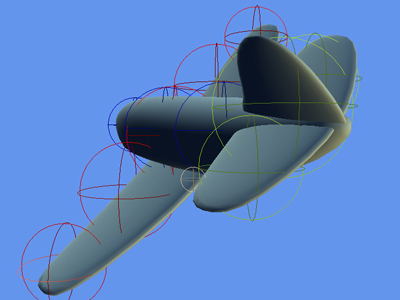 XNA Collision Detection for 3D models tutorial – revisited! Many people visit this blog for my 3D model collision detection tutorial. It’s nice to know it’s still in demand! I did it way back in the XNA v1.0 days (I think), so people are possibly having a bit of grief getting it working with XNA 2.0 & now 3.0. So, I’ve finally updated the sample to work with XNA 3.0, and improved it considerably. Head over here to get the updated sample. IMPORTANT: The actual tutorials have not been updated to reflect this XNA v3.0 version and refactoring. There’s a new interview of me talking about Air Legends, it’s development, Bionic Shark Studios, sales/pricing, and other stuff at ExL Studios. While I’m at it, if you’re a fan of Air Legends, get over to http://xblcg.info and rate Air Legends for me. …and if you’re not so much – well, perhaps hang on and try my coming-soon Update before making your judgment. Once again I’ve been quiet on the blogging front, but feverishly busy in every other way. An Update to Air Legends is coming very soon! I think it will please many, so do read on. In saying that, my update is not so much bug fixes, as addressing a common complaint that must surely be reducing the game’s appeal. So I reckon I’m justified in doing so, even if you could argue the changes are “features”. The core game features are unchanged. 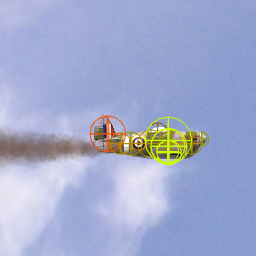 New “Flight School” mode for learning and practising the Controls. This is basically a free flight mode with interactive instruction, hints and tips. With regards to the new Speed mode. It’s amazing how slow “Normal” mode feels after playing Speedy & MANIC. Normal mode will still be the default however – I don’t want to alienate existing happy customers! Stay tuned. I hope to have the Update released in the next couple of weeks. 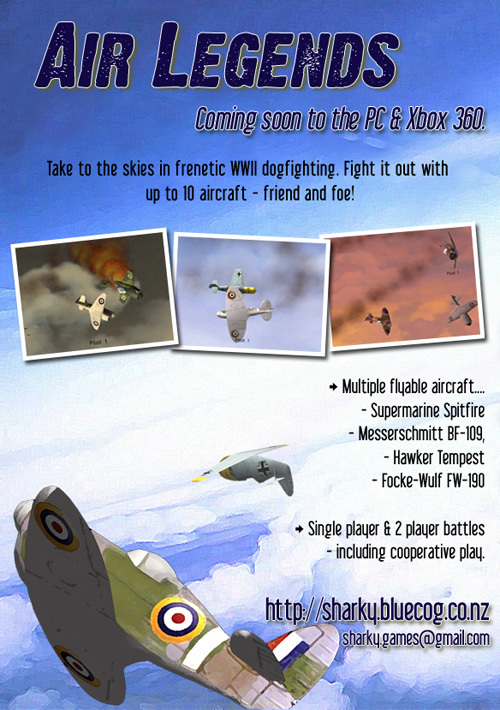 The Windows version of “Air Legends” is now available over here. Comes in two flavours: Demo (free) & Full game (for donations). functionaly the same as the Xbox 360 version, but with basic Keyboard support for those without 360 Controllers. 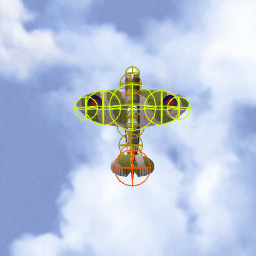 You may be familiar with my previously released work-in-progress builds of Air Legends. If so I recommend you try this new version. You’ll find it a considerably more featured and polished version to any you’ve tried before. It’s a supremely satisfying moment, though it hasn’t really sunk in yet. 2 years & 5 months in development. Just me tinkering away in my limited spare time. began as a tiny exercise to brush up on my .NET v2.0 skills at home – since my day job had me rotting in v1.1. the game is based on an unfinished game I attempted in BASIC back in the 80’s. 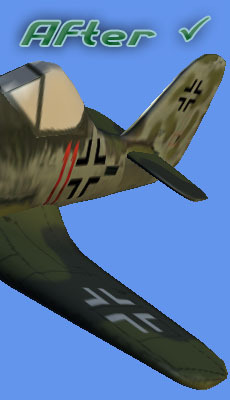 the distinctive rotation of the planes was something I came up with back then. I wanted you to enjoy all angles of the plane rather than the traditional 2D side view. I started it as a 2D game. Became 3D when I quickly learned what a mammoth task it would be coming up with sprites for all angles. In the 80’s it was easy with only 16×16, 2 colour sprites. the game had no name. The exe name was Legends.exe. 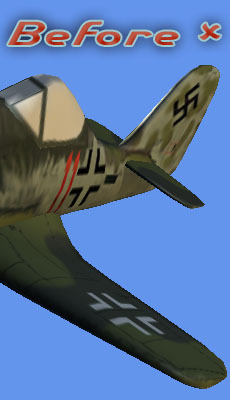 David Weller that suggested “Sharky’s Air Legends” when Microsoft needed a title for the first XNA showcase video. The name stuck. Thanks Dave. the project was scuttled much of 2007 thanks to certain personal events that hit hard. With a whole new life ahead energy levels returned and I resumed with vigour and a serious goal to make the life dream a reality. I dropped the “Sharky’s” prefix one day in 2008, when it dawned on me I could actually publish this thing one day! That’ll do for now. Bound to be more trivia – but I can blog that later. You are currently browsing the archives for the Game Development category.